IPsoft's Amelia is more interesting than Apple's Siri. Amelia's language is expressive. Her facial expressions and gestures are generated on the fly. Siri can show wit to an oddball question, but Amelia aims for empathy. Amelia is IPsoft's artificial intelligence platform. It has an ability to understand things in context and engage with the listener. Most importantly, Amelia is real enough to take your job. The system learns by observing interactions between a user and service agents. At one media client, IPsoft claims, Amelia takes 64% of its calls, and has reduced "knowledge worker" staffing from 76 to 32. The 2.0 version of Amelia was introduced at Gartner's Symposium IT/xpo, and among those watching the presentation was Mike Strenge, an infrastructure and operations manager at a financial services firm he didn't want identified. Here's a sample of Amelia 2.0. "I am blown away," said Strenge, following the demonstration. He's not convinced Amelia has emotional responses, "but I think we're getting there. It's a new technology that's going to advance, advance and advance," he said. 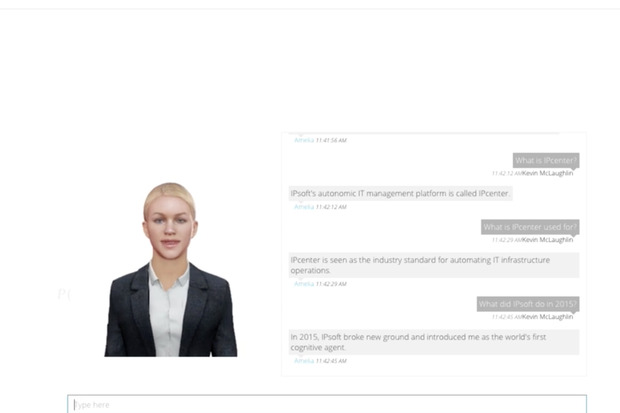 Cognitive system vendors, such as IPsoft, concentrate on automating sophisticated non-routine occupations, which can include financial analysts, insurance underwriters, tax preparers, managers, programmers and other problem-solving jobs. This next wave of automation may be as consequential as the impact of automation was on routine work. In 1991, routine employment, meaning repetitive, rule-based tasks both manual and cognitive, such as working in a factory, made up 58% of the U.S. workforce, but by 2011 had declined to 44%. Meanwhile, non-routine cognitive employment increased from 29% of the workforce in 1991 to 39% in 2011, according to Gartner analyst Ken McGee, in a conference presentation. Changes in workforce composition from 1991 to 2011. "Where are all the people who used to work in factories?" asked McGee, or the word-processing typing pool? Next on the list of automation opportunities is the growing area of non-routine cognitive work. "That's why smart machines are the hot topic right now," he said. It's also why Gartner believes robotic bosses or managers are on the way, and why 20% of all business content will soon be generated by machines. Vendors argue that automation will create better jobs that require more skills. The unanswered question is whether increasingly sophisticated automation will leave the economy with fewer jobs. "Wherever a human is servicing on the basis of standard operating procedure, cognitive agents are doing it, and can do it better," said Chetan Dube, the president and CEO of IPsoft, and a former math professor at New York University, in an interview. Dube won't assign an IQ to Amelia because "there is a component of IQ which is creative thinking. She would not do well on that." But for the things she has learned, "she will execute flawlessly," he said. Reasoning involves coming up with newer things that you haven't come up with before, Dube said. But he believes the science "is on the boundaries" of reasoning. Siri is in a different league. It is a virtual personal assistant that doesn't do mortgage processing, loan origination or insurance underwriting -- tasks that Amelia can accomplish. "Siri does the administrative task that a secretary would do," Dube said. Dube said machines will quickly take over a large section of jobs, certainly all mundane chores, and people will have to retool themselves for jobs that require more creative thinking. "That is the zone where man must move to," he said. Amelia, whose image is based on a University of Southern California student, also provides a preview into how these machines may evolve to become human companions. In the next decade, Dube said, you will pass somebody in a corridor and won't be able to tell if it is a woman or android. These machines "will take care of all the ordinary chores, and they will respond with complete empathy to you," he said.